This is a classic steak house salad that is very easy to make at home! Enjoy with any of my steak recipes for a steak house treat at home at a fraction of the price. Cipollini onions are being used, but shallots can be used instead. Makes 4 dinner salads. Adjust ingredient amounts for the number of people eating. In a medium sized skillet, heat the two tablespoons of olive oil over medium high heat. Add onions and sauté until edges begins to brown. Add sugar and stir until caramelized and add bacon. Sauté until bacon is slightly crisp. Add all other ingredients except for the spinach and cheese and stir until mixture begins to bubble. Let it bubble for just a few minutes to thicken. In a large mixing bowl, transfer spinach and pour vinaigrette over top. 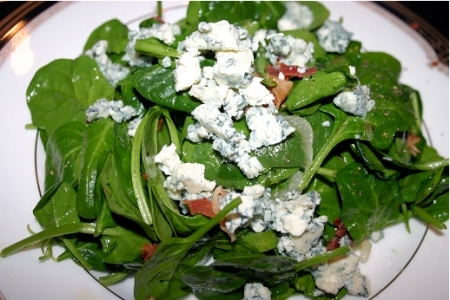 Mix together and transfer to four salad plates or bowls and top each with crumbled blue cheese. Try Joel Gott Cabernet Sauvignon (California), Becker Vineyards Cabernet Sauvignon Reserve (Texas), Deerfield Merlot Cuvée North Cost Sonoma County (California) or J. Lohr Paso Robles Merlot (California).